As my daughter prepares to enter Junior High School, I am coming to grips with a truth about myself: I am embarrassing. Sometimes it’s on purpose, like when I walk through public places singing songs from the Disney movie Frozen. Sometimes, however, I don’t mean to be embarrassing. I often talk too loud without realizing it. I have a tendency to strike up conversations with total strangers on the street. Are you easily embarrassed? Whether we like to admit it or not, all of us to some degree or another worry about what other people think. We want other people to like us, approve of us, accept us. And when they don’t, it’s hard. It’s embarrassing. George Bennard was a Methodist evangelist from the early part of the 20th century. He would travel around the Midwest leading tent revivals. At one such tent revival in Albion, Michigan in 1912, Bennard was publicly ridiculed for his faith. Someone stood up and made fun of him. That very night, he went home and wrote the first verse of the hymn we now know as The Old Rugged Cross. 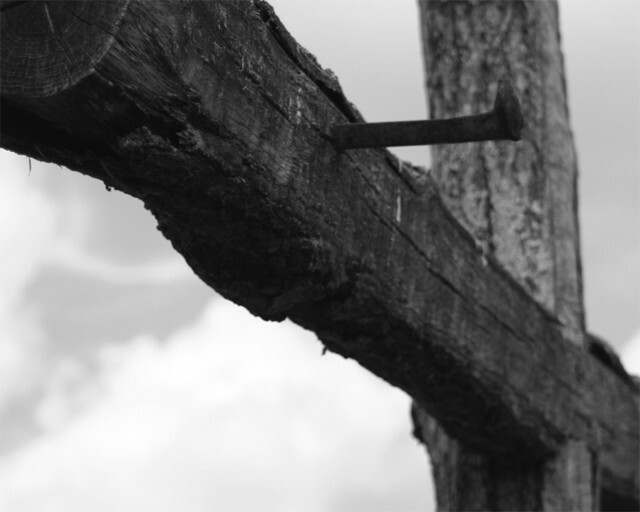 Are you embarrassed by the old rugged cross? We like to talk big. “I’m not ashamed of my God or my faith.” Yet, we have our moments. When the guys are telling dirty jokes or talking about their sexual exploits, you may not join in, but do you tell them to stop? Why not? Because you are embarrassed. You are worried what they will think about you or how they will treat you. No, we like to talk big about how we don’t care what other people think. We like to talk big about how we are not ashamed of our God or faith. Yet, we don’t always stand up. We don’t always speak out. What is the remedy to such embarrassment? How can we overcome that fear of not being accepted? The answer is found at the old rugged cross. Crosses were a symbol of brutality and death. They were a symbol of shame. But Christians for centuries have worn them with pride. We cherish the old rugged cross. Why? Because we see its true beauty. It was there our Savior stood up for us. It was there he wasn’t ashamed to call us his friends. It was there he showed us how much he loved us. To pardon and justify me. On that blood-stained cross, Jesus suffered your punishment, your death, your hell. On that blood-stained cross, he won for you forgiveness. Because of what Jesus did for you on the old rugged cross, God now accepts you just as you are. Even though you are dirty and rebellious, though you are often embarrassed to stand up for him, he is not ashamed to call you his son or daughter. Who cares what anybody else thinks? God thinks you’re great. The King of the universe looks at you as his perfect prince or princess. What does it matter what some sweaty teammate in the locker room thinks? What does it matter what those guys from work or the cool girls at school think about you? God accepts you. You don’t have to impress him or pretend to be anything you aren’t. He loves you just as you are. In fact, he loved you so much he let his enemies nail him to a cross. He suffered its brutality. He suffered your shame so that you could be with him forever in heaven. Honestly, if you stand up for what you believe, if you unabashedly live your faith, some people aren’t going to like you. Some people aren’t going to accept you. Some people are going to make fun of you. When we remember what is waiting for us because of Jesus’ old rugged cross, however, we are willing to bear its shame and reproach. I’m going to heaven, what does it matter if somebody makes fun of me? I’m going to heaven, what does it matter if someone doesn’t think I’m cool? I’m going to heaven, what can anyone really do to hurt me? So when you feel your face turning red in embarrassment, when you feel the pressure to not stand up or speak out, remember the old rugged cross. Remember how Jesus stood up for you. Remember how God accepts you just as you are – how he forgives you because of what Jesus did for you on that cross. Then cling to that old rugged cross. Cling to your Savior who died there for you. Hold that cross high without shame – without embarrassment – with the confidence that one day you will exchange it for a crown.